The largest ski carousel in the world comprises - in addition to 11 skiing areas in the Dolomites - also the Alta Badia ski region. The slopes and lift facilities in the Alta Badia are part of the ski carousel Dolomiti SuperSki. The choice is huge: 12 ski regions, 459 lift facilities, 1,200 km of ski slopes, 30 snowparks. Skiing causes unique emotions. Going down the slopes cares for a feeling of ease and has a positive effect on healthiness. But skiing also involves risks. With accredited South Tyrolean skiing instructors we show you the correct behaviour on the slopes. Right then – clip on your skis with us! 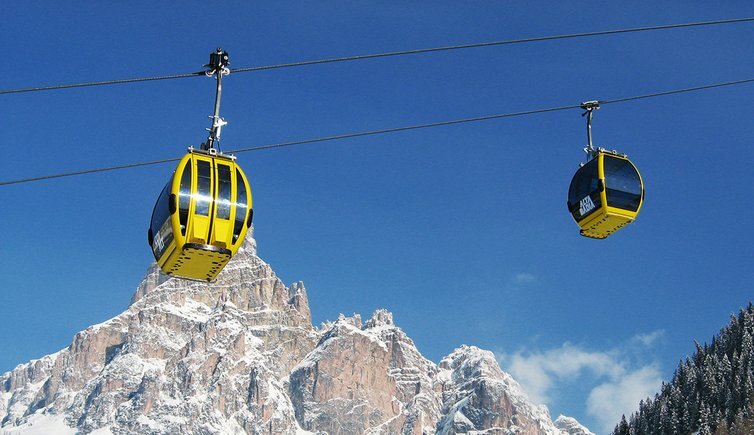 The ski carousel Dolomiti SuperSki has been established several years ago, when 12 skiing areas in the UNESCO World Heritage Site of the Dolomites decided to join. The possiblities this huge area offers between the 3,343 m high Marmolada, the Queen of the Dolomites, and the famous Sella Ronda, are practically endless. Including the Italian provinces of South Tyrol, Trentino, Belluno and the Veneto, the entire Dolomiti SuperSki region can be accessed with one ski-pass, the card My Dolomiti. However, children under 8 years ski for free, if a parent is in possession of a valid ski-pass - the best way to offer also families the possibility to live this unforgettable adventure. 1,200 km of ski slopes and 459 lift facilities provide unlimited pleasure on the slopes for beginners and experts, for skiers and freeriders. 30 snowparks have been realized for snowboarders. Moreover every night more than 300 snow groomers work in order to prepare the slopes for the next morning. Aren’t these perfect conditions for skiing holidays?